Helping to Build America's Communities Since 1928! Forms in this sections have been created using Adobe Acrobat. If you have problems opening the documents, please click on this icon to learn how to get Adobe Reader. 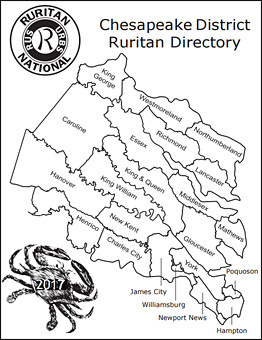 The Chesapeake District includes Ruritan Clubs from the following counties and cities: Hanover, Henrico, Charles City, New Kent, James City, Williamsburg, Newport News, Hampton, York Poquoson, King William, Gloucester, Mathews, King & Queen, Caroline, Essex, King George, Richmond, Westmoreland, Northumberland, Lancaster and Middlesex.